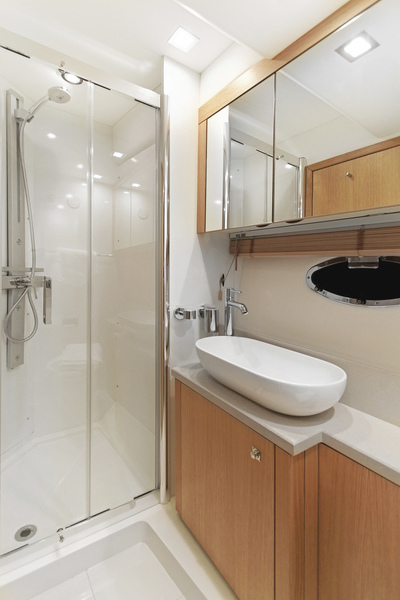 If there’s one thing many homeowners want, it’s to make a small bathroom larger. However, in most cases it’s just not possible to knock down a wall and physically add space to the bathroom. But with a little creative remodeling, you can create the illusion of space in your small bathroom and make it feel bigger than it actually is, all without knocking anything down. In this week’s blog, we’ll talk about a few remodeling tips for making your small bathroom feel bigger. Trying to make your small bathroom feel bigger? These tips will help! Consider replacing your sink with a pedestal or vessel sink. A pedestal sink will significantly cut down on the sink’s total footprint in your bathroom, not to mention its vertical lines will add to the impression of space. A vessel sink gives you storage space underneath the sink, and at the same time creates a visual focal point for the bathroom that has its own unique appeal. Many bathroom closets extend into the room instead of away from it, which means they take up a lot of space. One great way to add space to your small bathroom is to get rid of the closet and replace it with shelving or a cabinet, both of which are shallower than a closet. If you go the cabinet route, consider choosing a cabinet that extends from the floor to the ceiling, as this long vertical line will create the illusion of height and space in the bathroom. If you have a barrier to the entry of the shower, consider eliminating it and replacing it with a glass door that extends to the floor. A tub-style barrier or even a lip can make the room feel smaller. The consistent unbroken plane you’ll create will create the feeling of a larger space. Plus, glass showers let in more light and have a visual appeal that shower curtains can’t match. You’ve probably heard before that the best colors to make a space feel bigger are light and neutral. And while this is true, there’s also another visual effect that can be achieved by painting just one of the walls in a contrasting, darker color. This painting technique draws the eye to the darker color, making the room feel larger than it is. Measured use of horizontal stripes on small bathroom walls can also increase the feeling of space. The classic mirror wall is a tried-and-true way to make your small bathroom feel bigger. Just install a large mirror on one wall of the bathroom and you’ll immediately notice the effect. This entry was posted on Thursday, July 9th, 2015	at 1:29 pm	. You can follow any responses to this entry through the RSS 2.0	feed. Both comments and pings are currently closed.